IU1 Inhibits Dengue virus replication | Health Research, Inc. Fig 1. Effects of IU1 on DENV2 replication. A) DENV2 titer in the presence of various concentrations of IU1. 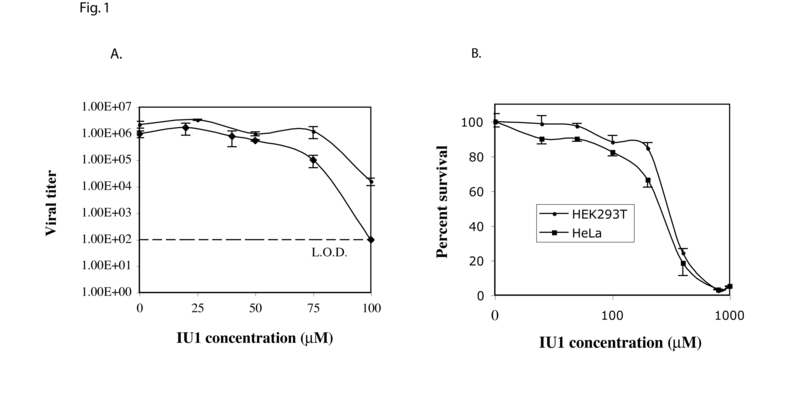 ♦ Cells pre-incubated with IU1; • IU1 added immediately following infection. The dotted line represents the limit of detection (L.O.D.) of the plaque assay. B) MTT-based cytotoxicity assay. Mean of three replicates are presented. Error bars represent standard deviation. Dengue (DENV) and West Nile (WNV) viruses are major arboviral human pathogens belonging to the genus Flavivirus. Due to their minimal genome ~ 11kb, these viruses require many host molecules for their replication and this offers a therapeutic avenue wherein host factors can be exploited as treatment targets. The results presented here show that a small molecule, IU1, of the deubiquitinating enzyme USP14, a component of the host ubiquitin-proteasome protein-degradation system, strongly inhibits Dengue virus replication as well as reduces West Nile virus, Yellow Fever virus, and La Crosse virus replication. The ubiquitin-proteasome system (UPS) is a key player in maintaining cellular protein homeostasis and is associated with various human diseases, including neurodegenerative disorders, cancer, and infectious diseases. Viruses from several families reprogram the UPS to make the cellular environment conducive to viral replication, and inhibition of the UPS interferes with viral propagation. Our researcher, Dr. Dilip Nag, discovered use of IU1, a small-molecule inhibitor of the proteasome-associated deubiquitinating enzyme (DUB) USP14 inhibits replication of several arboviruses. The proteasome is essential for life in eukaryotes and regulates many aspects of cell physiology. Ubiquitin is a small ~8.5 kDa regulatory protein found in most tissues of eukaryotes. The addition of ubiquitin to a substrate protein is called ubiquitination and affects proteins in many ways. It can mark them for degradation via the proteasome, alter their cellular location, affect their activity and promote or prevent protein interactions. Ubiquitination is a reversible process. The ubiquitin chain can be made shorter or removed by a set of enzymes known as deubiquitinating enzymes (DUBs) which modify these proteasome-bound ubiquitin chains. Small molecule approaches can easily be applied to different cell lines, even those from different species, including specialized cell types which may not be amenable to RNAi-based strategies. Small molecule inhibitors typically yield highly penetrant effects across whole cell populations. Rapid and reversible function of this small molecule may allow its target to first be inhibited then reactivated. Other RNAi-screening studies and several proteomic studies have identified the role of the ubiquitin-proteasome system (UPS) in WNV and DENV replication. Nag, DK; Finley, DJ A small molecule inhibitor of deubiquitinating enzyme USP14 inhibits Dengue virus replication. Virus Res. 2012 Apr;165(1):103-6. doi:10.1016/j.viruses.2012.01.009. Epub 2012 Jan 26.